What’s it going to be — an inexorable march toward a sixth NASCAR Sprint Cup Series championship for Jimmie Johnson, or another late-season failure for the No. 48 team? Based on the preponderance of evidence from Sunday’s AAA Texas 500 at Texas Motor Speedway, the sixth title seems the far more likely outcome. On the face of it, the circumstances are remarkably similar to those in play last season. Johnson won at Texas to take a seven-point lead in what had become a two-man battle for the championship against Brad Keselowski. On Sunday, Johnson’s victory at Texas game the five-time champion a seven-point lead over fourth-place finisher Matt Kenseth in what has evolved into a two-man race. Last year, Johnson lost his lead at Phoenix when he blew a tire and hit the wall. A muffed pit stop and a mechanical failure sealed his fate a week later at Homestead, and Keselowski was a first-time champion. The quality of Johnson’s performance Sunday at Texas suggests that it will be difficult, if not impossible to beat the No. 48 team over the next two weeks. First of all, Johnson’s Chevrolet had a clear edge in speed over every other car in the field. Why? For one thing, Hendrick Motorsports, which fields cars for Johnson, race runner-up Dale Earnhardt Jr., Jeff Gordon and Kasey Kahne, invested a lot of its resources in a test at Texas. Undeterred when rain curtailed their scheduled test at Texas after the Charlotte race in October, the Hendrick teams returned a week later to complete unfinished business. As it turned out, the decision was spot-on. Johnson led 255 of 334 laps en route to his sixth victory of the season. The Hendrick teams also tested at Homestead, site of the Nov. 17 season finale, but that in itself doesn’t give Johnson an automatic advantage. Kenseth and Joe Gibbs Racing teammates Kyle Busch and Denny Hamlin also tested at both tracks. Kenseth, however, blew a right front tire and hit the wall on the second day of the Texas test. In Knaus’ view, that had to color his approach to Sunday’s race. “I know if I was the 20 (Kenseth), and I came here and on my last day of testing I blew a right front tire, I’d be nervous as hell coming back to a race track,” Knaus said. “So that had to have been looming over them. Dismiss that as unabashed, not-so-subtle gamesmanship if you want to. But recognize also that it speaks to the confidence with which the Johnson, Knaus and the No. 48 team are approaching the final two races. Rick Hendrick is far from ready to stake a claim to what would be his 11th NASCAR Sprint Cup title as a team owner. But in a question-and-answer session with reporters after Sunday’s race, Hendrick, too, appeared justifiably confident. 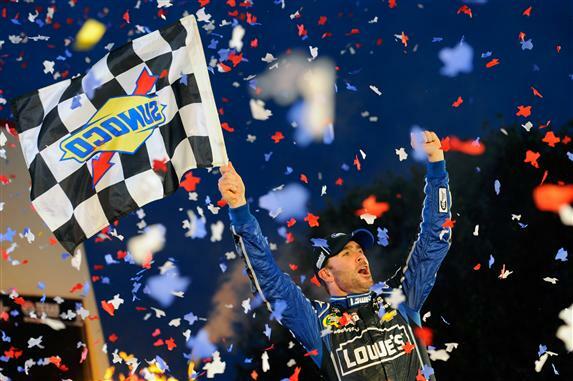 “Last year we were in this position, and we didn’t do it,” Hendrick said. “It fired us up. It fired Jimmie and Chad up. But they can’t work any harder.